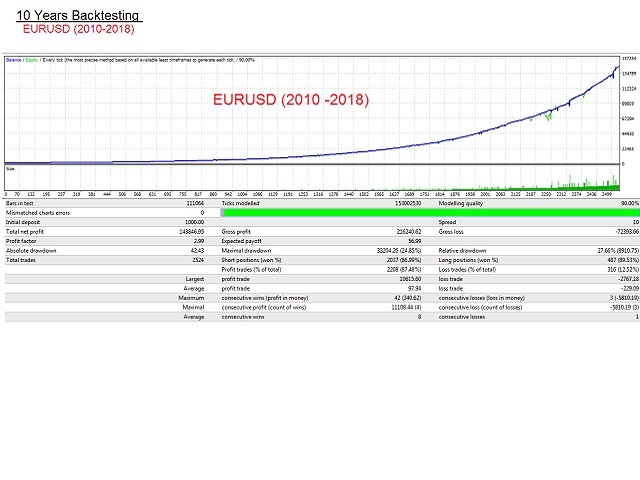 The Maverick is a fully automated EA design for trading EURUSD pair. It is design to trade along the trend and also trade during reversal. It uses adaptive grid strategy. In adaptive grid strategy the distance between the trade is not fixed, the entry of next trade is base on most favorable market condition to close the trade in profit. So the risk associated with normal grid/Martingale strategy is considerably reduced. Do not expect trade very frequently. It will take the trade only when trend is buildup. Back tested for 10 years (2010 to 2018) of real tick data and passed successfully. EA Settings : Use default settings or set files. Minimum Deposit : $600 USD. Withdraw the the profit frequently until the initial investment is recovered. MagicNum : Magic number of EA for trade identification. StartHour : Trade starting hours. EndHour : Trade ending hours . FridayTrade : Enable/Disable trade on Friday. MondayTrade : Enable/Disable trade on Monday. FixlotSize : fix Lot size. IsFixLotsSize : Enable/Disable auto increment of lot size . MaxTakeProfit : Max Take Profit. MaxStoplost : Max Stop lost. LostSizeIncrementAt : lot size increment by 0.01 for this amount. TradeOperation : Can assign to monitor the trade it will not take any new trade. TradeDirection : User can specify the direction of trade. by default it is both short and long direction. TradeDisable : EA will not enter any new trade. 1. Bug fixed for custom comment. Trade entry strategy is improved. Custom comment added. Now user can set the desired comment for the trade. for faster back testing GUI can be turn off. Update profit and loss calculation.